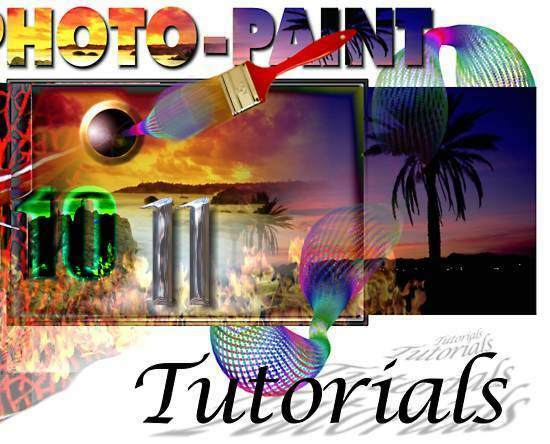 elcome to Visionary Voyager's Photo-Paint Tutorial series. The aim of this site is to share some of the experiences and techniques I have learned while using Corel Corporation's Photo-Paint® image editing software, and to express my appreciation of this superb graphics application. I hope that, in sharing some of my experiences and knowledge with you, you may consider this quite remarkable application when next you choose a graphics tool to express your artistic abilities. In my opinion, after using many different graphics software applications, including the so called 'leading' graphics applications from competitors, it is Corel's Photo-Paint that wins hands down every time, when one tallies up the 'bang for buck' comparisons. Corel Photo-Paint contains most, if not all of the features of its competitors, plus a great deal more. Moreover, almost every feature is substantially more flexible and powerful, especially when combined with an intuitive and powerful interface that includes Property Bars, Dockers and a completely customizable, exportable interface. You can even customize the workplace LIVE while you work, without the need to navigate complex menu structure. And you don't even need to restart - your customized changes are available immediately! Please accept my apologies for the lack of new tutorials recently. These take time to create and I have been busy with other projects. I hope to be able to add more of my own tutorials again soon. 1 - Nathan Segal: Nathan has written "The Photo-Paint X3 Insider" a 124 page, 19 chapter PDF guide for intermediate and advanced PHOTO-PAINT users. To get an idea of Nathan's tutorials there are three free video tutorials available here for you to check out. Please click on the banner below to link to Nathan's site and to purchase the Insider. The Insider costs US$29.95 and in my opinion, is well worth the money. One of my aims in 2005 is to create all new tutorials and tips using completely table-free CSS layouts. There are a number of problems stemming from browser differences in CSS implementation, particularly when the pages were printed. After considerable effort all new pages should now display and print correctly in most recent browser versions. To get the best from this site, please ensure you are using the latest version of the browser of your choice. Over time I hope to completely renovate this site's home page in a similar manner but it may take some time yet. I you notice something really strange or annoying, please feel free to contact me with the details of the error, section, page, Tut and the browser and OS you are using. Thanks. New Eyeball and Tentacles Tutorials and Custom Fountain Fills TIP. (see below). New Align & Distribute Tip/Tut added (here). New Host: Well, I've finally made the move across the Pacific. If you are reading this then you are viewing this site from a new server in the US. I had been with my previous Aussie service for 5 years and once-upon-a-time, when it was owned by a friend, it was pretty good. Then he sold the business and things started to go down hill. This year alone my sites were down several times for at least a couple of days each time. Not very good for tutorial hungry visitors! So lets see how this new host pans out. At least it should be quicker for US and UK visitors, even though the previous host was better for Aussie visitors. New Email address: Recently the amount of spam being sent around to openly viewable email address on the web has been nothing short of breath-taking. Similarly with viruses (I'm glad I have a good virus checker!). So I've had to make some changes in the way I publicise my email addresses to reduce the amount of spam and viruses I get. Spammers and Spam List sellers often use robots to trawl the web and collect email addresses on web sites. All easily visible email addresses are at risk. So I am now using a NEW email address for this site and this address is now cloaked so that robots can't easily find it. It is just as easy for you to use though - just click any of the normal 'contact me' links. Please delete any old visionary-voyager.com.au addresses you may have from your address books as soon these will no longer function. Also, please don't store the new address in your email address books - just use the links from this site. This will then reduce the spread of viruses that use address books. Your help in this matter is greatly appreciated and will assist in my ability to continue to add more tutorials to this site. Thanks in advance. A few other changes are mostly cosmetic or technical. The site will now use some neat scripts which will make the site cleaner to use in newer browsers. See if you can notice any of the changes. - David Mutch, May, 2003. These tutorials are provided free of charge for your enjoyment. However, although some of this material may be reproduced, there are some caveats, so please read the copyright notice below and contact me first. If you have any comments, suggestions, criticisms, or would like to contribute an article or graphic to this site (I am happy to help promote other people's work), please contact me. I intend to update this site regularly so please drop by often and see what's new. I may even start up a mailing list if enough people are interested. Stay tuned, enjoy yourself while you are here, and most importantly, explore, experiment, create, destroy and recreate - let your mind and your love of the graphical arts lead you down many wonderful paths to many exciting creations. Date on-line: 11th August, 1998. Explains how to use History UNDO and REDO lists, and how they can be used to create scripts. Also, we take a peek at the terrific clip-to-object feature. Date on-line: 3rd September, 1998. We construct a logo for our group. This tutorial uses paths, masks, stroke masks, textured fills, warp effects, brush nibs and strokes, and merge modes. Date on-line: 5th January, 1999. Shows how easy it is to create a torn edge effect using PP8. Suggestions for advanced effects are also given with examples. Uses orbits, masks and merge modes. How do you easily create highly optimised, fast loading web graphics ? PP8 is one heck of a great tool for producing both GIFs and JPEGs. - Global image Colour Alterations. Date on-line: 29th July, 1999. Deals with making alterations to image colours on an image-wide basis or on large planes such as entire backgrounds or foregrounds. There is also a section on the use of masks in such operations. Date online: 19th October, 1999. Updated and repaired: June, 2001. An in depth look at some of Photo-Paint version 9's best features. Includes an extended look at PP9's new Object Blend ! Date online: 25 June 2001. An in depth look at the new features in Photo-Paint 10. Installation of the Service Pack/s for this is fairly important due to numerous reported problems. However, I personally have found it to be quite stable and use it for all my work now. Date online: 26 June 2001. Shows how to create simple cutouts in Photo-Paint versions 8+. There are a number of other methods but this one is about the easiest. Originally posted to a PP9 newsgroup by David MacDonald (thanks). Although PP10 now has it's own Red Eye Effect tool, this brush allows uses of many versions of PP to have their own as well. Another question posted to a Corel newsgroup inspired this tutorial. A simple method to create 3D looking images by allowing object's shadows to follow surfaces behind the object. This tutorial shows how to make simple text effects masks, clips, blurs, POM and a variety of other easy methods. Additional tips for using Lock Transparency, Paint on Mask and others are included. These tutorials shows how to make metallic-looking text: Brushed, Chrome, Gold, Copper, and Patina. Techniques used include masks, fills, blurs, POM and a variety of other interesting. A series of 10 different text effects tutorials. These show you how to make candy, cookie, phong, cubic, dotty, dramatic, electric, lens, sand and stone text. A wide variety of techniques are used. The six tutorials in this series show you how to make stunning Fire and Ice text effects. A wide variety of techniques used. Fifteen tutorials to show you how to use Art Stroke Effects to liven up your photos. Fun With Photos # 2: Borders, Frame Effects and Picture Frames. Nine tutorials to show you how to create image borders, image FRAME Effects, multi-photo displays and classic Picture Frames. Create an Eyeball in Corel Photo-Paint. NEW! Easily create a realistic eyeball. Uses the Repeat Brushstroke command to help create the iris streaks. Tentacles for Your Octopus's Garden. NEW! Easily create tentacles and organic shapes. Uses simple commands and effects.. Fill Bucket Tool vs Edit Fill. What's the difference? More tips should be available in the near future. If there is a particular feature or technique you would like demonstrated or that you would like to share with others through this site, also let me know. CEO, Visionary Voyager Corporation (ABN 19 085 264 080). A Multimedia and Internet publishing company, Melbourne, Australia. I am always eagerly involved with the Corel Down Under Inc. User Group in Melbourne, Australia. These tutorials are often a result of presentations delivered to this group or to various classes I teach. Other than that I have no direct affiliation with Corel or any of their associated companies. I enjoy graphics arts and web publishing a great deal and run a small but successful web design/ web development company which currently develops much on-line materials for academic, medical and business clients. Occasionally, I also lecture in graphic design, web-related topics, Corel Draw and Photo-Paint. I am happy to discuss any matters relating to these pages, or Corel Photo-Paint or Draw, or in relation to my Web Design / Web Development affairs. Legal Mumbo Jumbo: (has to be here, sorry). All custom materials and design on this site, including graphics, programming and text, are Copyright, © 1998-2001 David Mutch and Visionary Voyager Corporation (ABN 19 085 264 080). All rights reserved. Where stated, some materials and concepts have been obtained and/or modified from publicly available sources and credit it given to the original author/s wherever possible. The tutorials on this site are supplied for personal learning only. They may be printed or stored on a users hard disk drive to facilitate ease of use but only for individual and personal use. The personal user must agree not reprint or reproduce any materials from this site for further distribution. Reproduction of any part of this site onto another site, electronic or print medium for any other reason requires the express permission of David Mutch and Visionary Voyager Corporation. Permission may be granted for limited reproduction of these tutorials providing any alterations, inclusions or omissions are agreed to by David Mutch and Visionary Voyager Corporation and that an agreed copyright notice be presented intact with any reproduced materials. Permission is granted for anyone to use any of the graphics provided in the tutorials on a personal basis for the purposes of learning the techniques shown in the tutorials providing this does not infringe any prior copyright ownership of the images by a third party. In the case of prior third party ownership, the user must abide by the requirements of the copyright owner. Visionary Voyager Corporation is in no way affiliated or related to Corel Corporation® and cannot be held responsible for all and any consequences, direct or indirect, arising from the use any of the materials, methods, techniques or tips displayed or described on this site. David Mutch is a member of the Corel Down Under Inc. User Group and personally supports the use of Corel Corporation® software. All materials and information are provided as is, for entertainment purposes only, and do not constitute an approved instruction course in graphic design or the use of any particular software product. Baring all that, this site is provided free for any and all to enjoy.